Alsace, in north-east France, has been making great wine nearly forever, and although top notch Alsacian wines are somewhat of a niche geeky wine thing these days, this was not always so. Alsacian wines were once the most famous and expensive of all of Europe. Although clearly French now, Alsace has both been part of France and Germany at various times. They have been praised since at least the 500s. In 800, there were there were 108 distinct villages making wine. There is enormous history here. 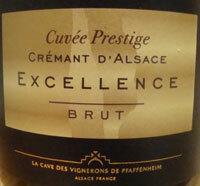 Cremant d'Alsace, a sparkling wine, has been made since 1900, and became an Appellation d'Origine Contrôlée or AOC in 1976 ( a "controlled designation of origin" protected by law). It is made via the same method as Champagne. Cremant d'Alsace wines are not odd nor niche wines as over 30 million bottles are made yearly, way up from under 1 million pre-1980. Both white and rose wines are made. Allowable grapes include pinot noir, chardonnay, riesling, pinot blanc, pinot gris, and auxerrois blanc. Rose wines must be 100% pinot noir. I'll admit that despite having tasted some of the best wines of Alsace, including some with age on them, they have never been my favorites. I've always enjoyed them, but they've never blown me away. So I must say I was very pleasantly surprised by the wine below! Brief notes from a party. The nose is apple, a tough of orange peel, and spritzy minerals. The taste is nice and lively apple with a very pleasant mouth feel. This is really nice. Very clean and precise tasting.